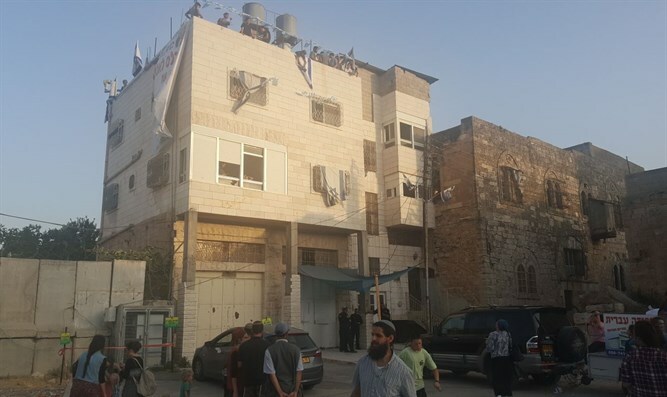 Resident of 'Machpelah House' in Hevron says Civil Administration creating rules in order to keep Jews out. The Jewish residents who purchased the Machpelah House and moved into the structure last week say they are there to stay, and have no intention of leaving. Rabbi Uziyahu Sharav, one of the Jews who bought the dwelling with the help of the 'Harchivi' organization, told Arutz Sheva: "This is really absurd. This is a house that was purchased five years ago. All the [state] apparatuses know that it was purchased legally, including the Defense Minister." "The Civil Administration came up with a regulation that did not exist anywhere in the world or in the State of Israel, saying that in order for us to enter the house, it must be registered. "This concept does not exist anywhere else in the world. It is a law which the Civil Administration invented specifically for this house. Now they are planning on leading us in circles for years until they finally grant us approval," he said. Rabbi Sharav strongly criticized the Civil Administration and accused it of being "a body that acts systematically and ideologically against the settlement in Judea and Samaria. When I meet ministers, they say that is is also happening in other locations. There is a fundamental problem with the Civil Administration, and someone needs to deal with it at a fundamental level." Rabbi Sharav said the Civil Administration refuses to take action against the rampant illegal Arab construction in Area C. "Look what's happening on the way to Jerusalem, entire [illegal] Palestinian cities in Area C, and unfortunately the Israeli government, which is a right-wing government, does not have the strength to stand up to the officials." He said that the Jewish families who bought the Machpelah House do not intend to leave it so quickly. "We will buy and buy and buy and with God's help we will make a continuum of Jewish construction [with houses we will] also buy on the other side of the city. We have come [to live here] forever, and nothing will deter us. And even if we ourselves do not see the results, our children will see them."